Saturday 18th February 2006 (7.30pm) - The Wurzels at PPUK Muscular Dystrophy Fundraiser at The Scotch Horn Leisure Centre, Nailsea, North Somerset. After an absence of 5 years, the Wurzels return to their home town to help Matthew Barrett, who has Duchenne muscular dystrophy. Saturday 17th June 2006 - The Wurzels' Big Summer Party at Godney Farm, Godney Road, Godney, Glastonbury, Somerset BA5 1RX Organised by the Masqueraders Carnival Club, this event was billed as possibly the country's biggest Wurzel party ever. Review here. Friday 30th June 2006 - Westhorpe Events present The Wurzels and John Ward (6pm) at Lodge Farm, Westhorpe, Stowmarket, Suffolk IP14 4TA. Tickets £22.00 (no concessions). All proceeds to the East Anglian Air Ambulance. Hog Roast and Licensed Bar. Contact Patrick Barker on 07876 496067 or events@ejbarker.co.uk. 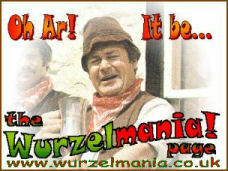 Sunday 17th September 2006 - The Wurzels and DAZ at Ship & Castle, Ashton Vale, Bristol. Show starts at 4pm followed by live music and entertaiment with "DAZ" til late! The last batch of remaining tickets are now on sale £10 p.p. in advance, £15 on the door, although the other two times they have played at the pub, it has been sold out prior to the day and none have been available on the door, so advance purchase is strongly reccommended for anyone that is interested.